I have many “favorite” letters at the Drew Archival Library, but one, written on New Year’s Day, 1842, by a young teacher named William Pingrey Webster, is the holiday-themed correspondence I like best. 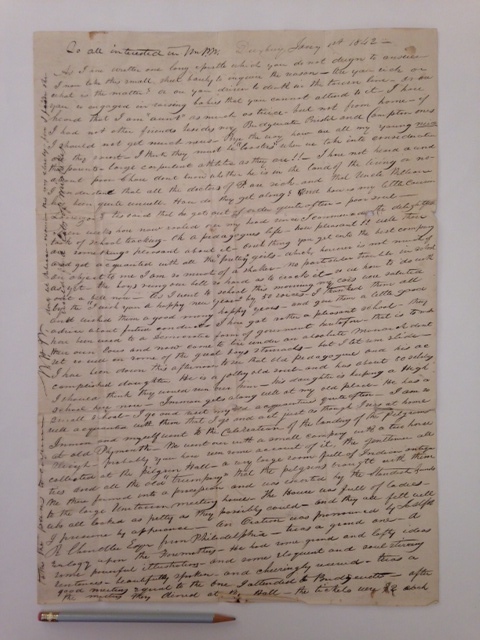 It is interesting for many reasons – it is witty, tells of seasonal happenings and mentions some Duxbury folk by name, but perhaps the reason I place it so high on my list of wonderful letters is because William wrote it on an extremely large piece of 28” x 40” paper, filling every bit of it. In a time when postage was paid by the recipient, we can only imagine the joke that was played on William’s unsuspecting brother, Walter R. Webster, when the large missive was delivered to his Plymouth, NH home. William’s sense of humor is sprinkled throughout the letter, some allusions we understand and some short-hand comments are clearly inside jokes between the brothers that we cannot possible decipher. Certificate issued by Town of Duxbury, 1839 stating William P. Webster is qualified to teach. In his spare time William was quite busy. From the vivid descriptions of his activities during the month of December we really get a glimpse of a typical South Shore holiday season during the antebellum period. On December 22nd, he and his friend, Inman (also a teacher in Duxbury), took a two hour sleigh ride with friends to Plymouth to enjoy the festivities surrounding Forefather’s Day, the anniversary of the landing of the Pilgrims. All the men met at Pilgrim Hall, “a very large room full of Indian antiquities and all the old ‘trumpery’ that the Pilgrims brought with them” and proceeded, escorted by the Standish Guards, to the Unitarian Church. There they heard a rousing speech on the “foremothers” by Joseph R. Chandler, Esq. of Philadelphia. Dining at Pilgrim Hall following the ceremony cost $2, a price too rich for William. He and Inman went to the Pilgrim House instead where they ate turkey. A ball that evening was also far too costly for the young teacher – at $3 a ticket he had to turn down a young Plymouth lady who invited him, noting to his brother, “tis a trouble to be poor.” A dancing party the same evening in his own neighborhood probably took some of the sting out of his straitened circumstances. The following Saturday evening, William attended the Christmas celebration at the Universalist church on Washington Street in Duxbury which was “’jock full’ and very neatly trimmed with evergreen.” Religion was a bit more fluid during this period and members of various Protestant denominations would frequent each other’s meetings. A particularly good visiting minister at any church was always an event not to be missed no matter what your affiliation. William went half the time to the Unitarian Church and the other half to the Universalists – where he could also see Methodists. 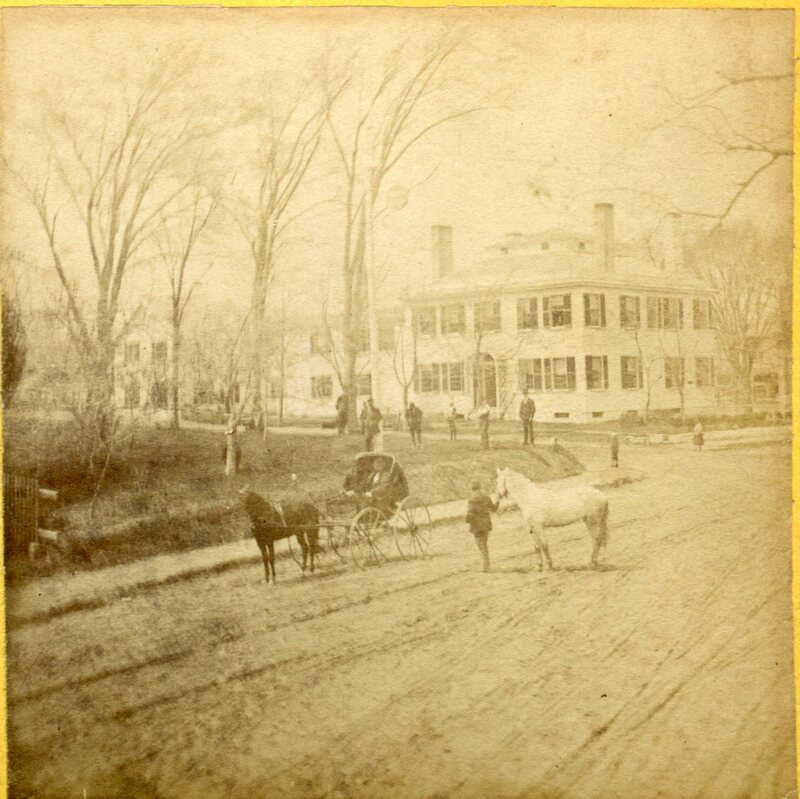 Washington Street, Duxbury with Seth Sprague, Jr. House, c. 1870. 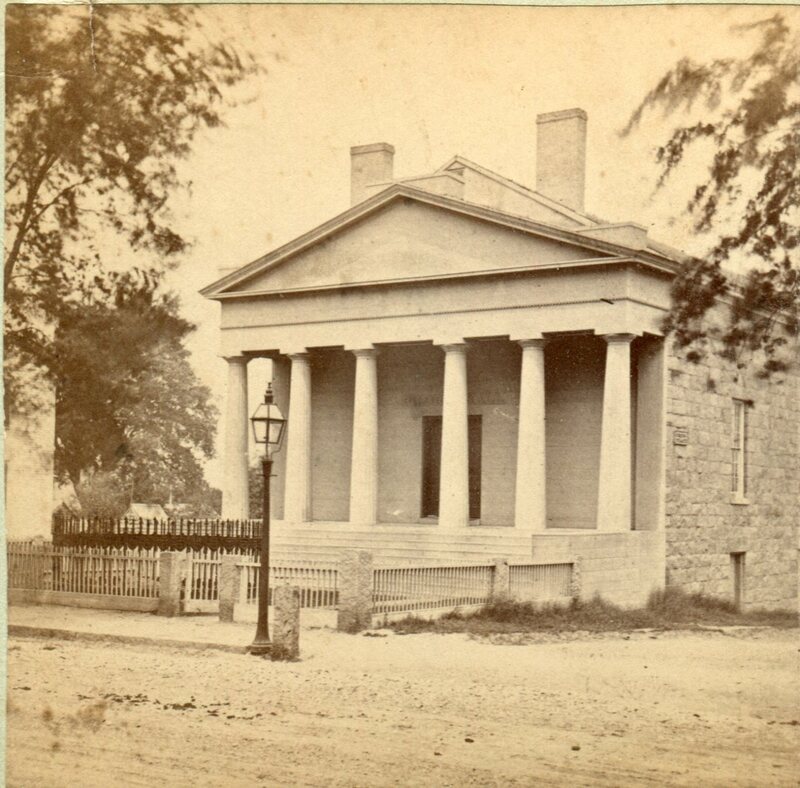 William was also a member the Duxbury Lyceum, also known as the Debating Society of Duxbury. The Lyceum was formed in 1832 by a group of mostly young men and women who gathered together to argue popular topics of the day. During December 1841, the little group considered the questions, “Ought parents to choose the partners for their children” (William spoke in the affirmative); “Is there anything improper on a ladies making a proposition to a gentleman for marriage,” (William supported the negative); and, “Are early marriages advisable” (William would have spoken for the affirmative if it had not been too cold to attend). Much of his arguments were definitely made with a bit of tongue in cheek. In addition to his debating, he attended a singing school held two evenings a week. Now, it is incumbent upon me to tell you what became of our humorous friend. I debated whether to write this article without mentioning William’s future and let you all believe that his pole pointed toward a long life filled with many more holidays. But, I knew there would be at least a few among you who would be unsatisfied with that, so I will tell you what became of him. William’s death came just two years after this letter was written, when he was a mere 27 years old. He died of consumption (tuberculosis), a disease that was far too common in the 19th and early 20th centuries and took many lives. He is buried in the Webster Cross cemetery in Bridgewater, NH. But, I prefer not to dwell on that and would rather image our young jokester as he was on New Year’s day in 1842, bent over a overly large piece of paper, chuckling to himself as he recounted his December in Duxbury. Pilgrim House was a hotel on the corner of Main and Middle Streets in downtown Plymouth established by Danville Bryant in 1834. It burned on June 20, 1846. At the time of William Webster’s turkey dinner, the hotel was owned by Francis J. Goddard. In 1856 Union Hall was built on the site. See A Christmas Romance in Duxbury for more history on the local Unitarian Church.